Summary: Rescue Dawn is a powerful fight for survival. The horrors of the Vietnam War have been the foundations for many distressing trips into the jungle with American troops. Platoon and Apocalypse Now depicted the kind of experiences that shattered the lives of thousands. 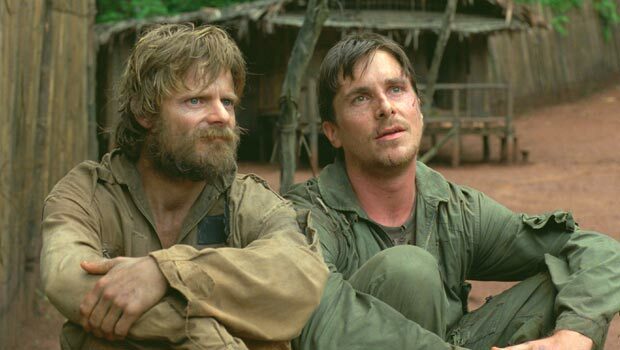 In that respect, Rescue Dawn offers a similarly distressing scenario of German-American US fighter pilot Dieter Dengler (Bale) shot down and captured in Laos during the Vietnam War. Marched and dragged to a small POW prison camp he is tortured, left to go hungry and surrounded by a handful of broken men resigned to their loss of freedom. However, Dieter, despite being the lone voice of hope, is convinced he will get the upper hand and carefully plots a daring escape in a rare true story from the Vietnam War that does find some human spirit in the midst of so much despair. Rescue Dawn is writer/director Werner Herzog’s return to a subject he covered as a documentary in 1997, entitled Little Dieter Needs to Fly. Then he recounted Dieter’s fight for freedom from a perspective of a man recalling his own memories of the experience. Ten years later, Herzog brings a fictionalised account to the screen which has an honesty in its telling to forgo the need for dramatic portraits of heroes or villains: he lets the events speak for themselves. Herzog’s style is not easy to get to grips with initially as Dieter’s briefing aboard an aircraft carrier, bombing mission and crash landing look as though they were taken from a low budget 1980s war movie. Once he starts pitting his wits against the Viet Cong in the jungle, though, tension creeps into Rescue Dawn until he is captured and subjected to torture before getting locked up. Although his spirit remains unbroken, his emancipated cellmates indicate the worst is yet to come. Duane Martin (Zahn) is losing his mind while Eugene ‘Gene’ McBroom (Davies) is a convinced they have no hope – Dieter’s determination to escape seems to be the only thing keeping him alive. At first it is hard to believe he could do it, but as time goes on it becomes apparent his ceaseless optimism is not misplaced. The often light-hearted atmosphere in the prison camp could easily have threatened to ruin Herzog’s good intentions as he shows day-to-day activities where they are rarely put in any danger by the guards, yet this is also his masterstroke. When Dieter’s plan to escape works it quickly becomes apparent how hostile the jungle is in comparison, and leads to distressing acts of survival. The joyous moment at its climax comes at a high price. With Bale on top form and Zahn, normally a comical figure, putting in a dramatic performance few may have thought him capable, Rescue Dawn is a powerful fight for survival. There are no attempts to overindulge in heroic warfare or misplaced glorification – Herzog plays it straight down the line to ensure Dieter’s efforts aren’t tarnished by glitz or glamour. It offers a rare uplifting moment from a war that brought so much pain.